stopped - or at least "kicked into the long grass"
H&F Conservatives’ Town Hall office and demolition scheme has been stopped – for now. 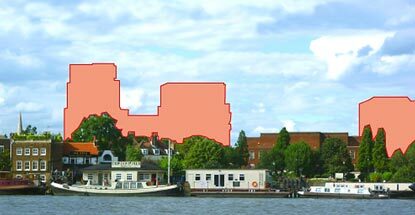 The Greater London Authority was apparently about to refuse the controversial scheme which was granted planning permission by H&F's Conservative councillors on 30th November. The GLA had reached the conclusion that it breached their regional planning rules - as well as those of this Borough. However, H&F Conservatives pleaded with Mayor Boris Johnson to let them "withdraw" it instead "until further notice." He agreed and so has allowed them the opportunity to bring it back at some future point without the public currently seeing all of the GLA's criticisms. It is still a "live planning application." So sadly this is not our VE day, it's more like D Day instead. But it is still a battle victory and a humiliating slap in the face for the Conservative Administration, their planning officials and for those Conservative Councillors that block voted it through, without asking a single testing question. There appears to have been some intriguing goings-on behind the scenes. I understand that Mayor Boris Johnson (Con) was furious at having this issue land on his desk just five months before the Mayoral and GLA elections. Thousands of residents from across south west London have protested about it and were emailing the him in droves. Indeed many, including actress Vanessa Redgrave, were taking part in a vigil outside City Hall only yesterday. A reliable source told me that Mayor Johnson and leading members of H&F's Administration have been engaged in "heated discussions." It has now been "kicked into the long grass." However, H&F's Conservative Administration needs to rip these plans up, drop their £35m office project and agree to protect the cinema, the park, the skyline and the homes they were going to demolish. They should use this opportunity to start fresh talks with residents about what might work best. That's what I will do should Labour win control of the Council on 1st May 2014 - assuming H&F Conservatives haven’t been allowed to grant a further planning permission by then. For now, we must understand exactly what concerns the GLA raised about this project. Those need to be published so Hammersmith and Fulham's Conservative Administration can properly be held to account should they bring this back after the Mayoral election or propose anything similar during the next two and a half years. There also needs to be an inquiry into the money that's been wasted on this scheme. Senior Conservative councillors and their officials have been working on it since 2006. They have spend millions of tax pounds on consultants, trips abroad to meet property speculators and time putting it all together. On top of that, they were in the process of offering property speculators well over £70m of public land to make this scheme go through. Anyone that attended the Planning Committee on 30th November would have got a strong whiff of the weakness of the Administration’s case. This is a gargantuan mess. We need to understand how they got it so wrong and how that was allowed to happen consistently during the five years they all worked on it. And when we do, maybe there will be some resignations from the Cabinet Members and senior officials that were behind this project as well as the Planning Committee members that voted this scheme through. You can read more about this in The Standard, the Shepherds Bush Blog and the local Chronicle. This is just a scam by Boris to stop him losing votes before the election but he has been caught out!